The Transition Smuggler GX evo Complete Mountain Bike is guaranteed to change your perception of big-wheeled ponies. An aggressive geometry highlighted by the 67.5° head angle lends confidence to the descent while the 29-inch wheels and award winning Giddy Up suspension design work in unison to smooth out rocks and roots. A monster truck with great traction that can also mach through berms and scrub jumps like a more traditional trail bike, the Transition Smuggler GX evo Complete Mountain Bike is a spicy singletrack connoisseur that's waiting for you to saddle up and drop the hammer. Decked out with a cutting-edge GX Eagle™ drivetrain and RockShox suspension build that's exclusive to evo, we wouldn't blame you if you're already fantasizing about smuggling this bad boy out to your local trails. Progressive Geometry  Long, low and slack. Giddy Up Suspension System  When Transition set out to design the new family of trail bikes, they wanted to improve their suspension bike pedaling performance, but didn't want to lose the neutral and comfortable feel that Transition Bikes are known for. No one at Transition wanted a suspension system that felt like it was locking out, or provided any "kick back" in the pedals. Their Giddy Up link is specifically tuned with a moderate amount of chain growth which is highest at the sag point and decreasing deeper into the travel. Because of this finely tuned wheel path, the new models have a notable increase in traction when climbing, without the rider noticing the chain growth fighting the suspension movement. The ride feel of Giddy Up Link bikes will be familiar for any previous Transition rider, but with a big improvement in suspension performance. Their new models are designed to be active while climbing; increased compression damping or rear shock platforms are not required with the Giddy Up link. The suspension remains free to smooth out the trail, improve traction and control without sacrificing any efficiency. There is no need to think about flipping switches; start your ride with the shock open and leave it there. With Giddy Up you can focus on the trail, not your remotes, levers or knobs. Just grab your bike, Giddy Up and go. RockShox Monarch RT3 DebonAir  Featuring silky smooth travel in a new lightweight design, Monarch floats through bumps even better than before, turning rugged trails into tire-gripping velvet. The chassis is lean while maintaining the durability and adjustability needed to bite off huge chunks of burly trail action and epic cross country. RockShox Pike RCT3  It is the new-school all-mountain and enduro riders’ weapon of choice. It has received critical acclaim by the global mountain-bike media. It came out of the box and marched its way to an Enduro World Series overall title. And with good reason. PIKE was engineered to provide the plushest, most high-performance ride quality imaginable. Its Charger Damper with Rapid Recovery keeps you riding high in the travel, where the feel is plushest, and maintains your bike’s natural geometry. Its stiffness to weight to travel ratios are unbeatable, meaning you get a lot more from a lot less. Better control from fewer and more intuitive rider inputs allow you to charge harder. Which equals time and energy for more laps. If all-mountain riding and enduro racing is how you describe a good day in the saddle, then PIKE should be on your ride. SRAM GX Eagle™ Drivetrain  Eagle™ drivetrains are designed, tested and proven to deliver the lightest, highest-performing, most durable systems for all riders on any trail. Eagle™ technology provides an expanded, optimum gear range that allows you to realize your bike's potential beyond where it has ever been. Every SRAM GX Eagle™ component is 100% compatible with all levels of SRAM Eagle™ drivetrain systems. SRAM Guide R Hydrualic Disc Brakes  What’s it going to take to ride that line? It’s steep. It’s rocky. You’ve passed it a hundred times. But not this time. With the all-new SRAM Guide R, you have the power. Proven 4-piston calipers give you smooth, one-finger control. Features like Reach Adjust let you dial it in just right. And Guide perfectly complements other SRAM components and gives you flawless performance on every ride. Now featuring the World Championship-winning S4 caliper with Bleeding Edge™ and Heat Shield technologies. Race Face Æffect R Wheelset  Boasting a 30mm internal rim width and increased strength, the Æffect R is built to shred aggressive all-mountain trails and Enduro races. In addition to a great rim, the Æffect R incorporates a new Race Face Trace hub design with full cartridge bearings for extended life and durability. The hub also boasts a competitive 9.2º of engagement using a durable 3 pawl design. These hubs are tough, think a clydesdale with a motor kind of tough. Æffect wheels can handle almost anything you can throw at them. Schwalbe Nobby Nic Tires  The all-rounder that works in every situation, no matter the weather, no matter the terrain. 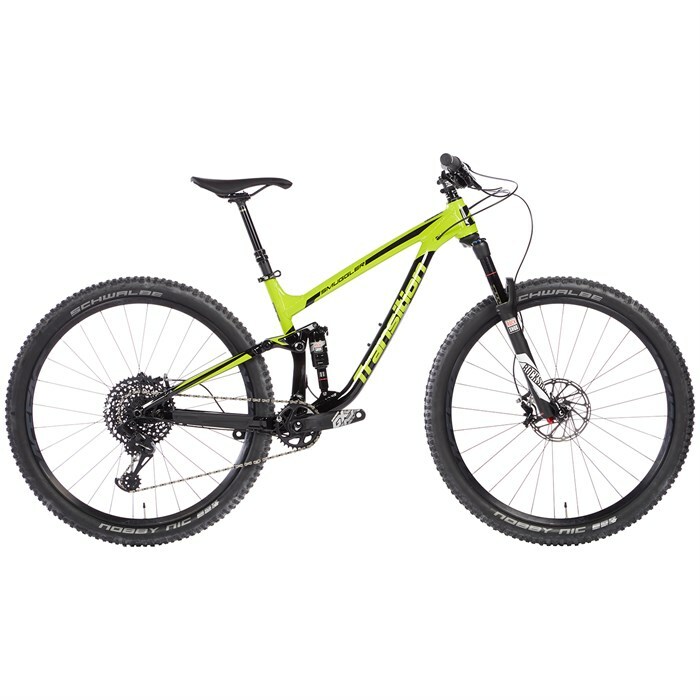 Widest possible range of use: for tour and all-mountain, for difficult cross-country tracks as well as technically challenging enduro trails. Excellent traction and braking performance thanks to special central stud arrangement, large shoulder studs for excellent control on tricky trails. RockShox Reverb Stealth Dropper Seatpost  Don't let its familiar good looks fool you -- Reverb is a whole new weapon. Its internals have been completely re-engineered to improve on its already legendary performance and to offer enhanced reliability: all the smallest details, down to the single seal, have been re-evaluated and updated to pass the hardest and longest durability tests. Additional bushing overlap also improves performance over time. This is the brand-new Reverb, engineered for the next-generation mountain biker.